Plan reviews and constructability assessments. Stakeholder outreach and coordination assistance. Installation of 12,100 LF of 6” PVC sewer force main. Installation of 1,100 lineal feet of 6” DIP sewer force main. Installation of a new sewer lift station including electrical, instrumentation, and odor control. Sewer bypass operations during lift station commissioning. Numerous services, blow offs, fence repairs, sidewalk replacements, manhole upgrades. 4,400 square yards of pavement replacement. 33,000 square yards of asphalt slurry seal coat. 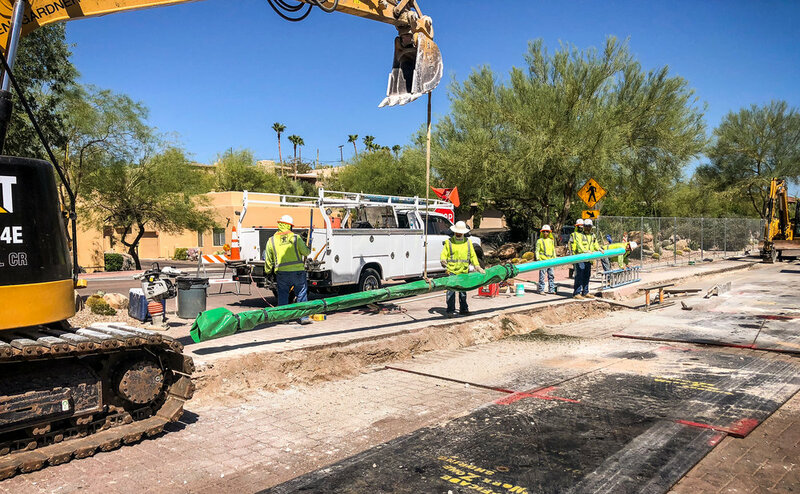 Environmental controls and permitting including SWPPP, Maricopa County Dust Control, and assistance with City of Scottsdale permitting, Town of Carefree permitting, and Maricopa County Department of Environmental Services approval.